Need long range Wi-Fi connection on all of your smart phones, tablets and other wireless devices ? Then our new WL70+iKConnect bundle is the solutiuon you are looking for. iKConnect is a mini wireless router, that can be powered directly from the boat’s 12v DC supply, to create your own onboard wireless network. Internet connection is provided by the WL70 that plugs in to the iKConnect’s USB port and provides the long range Wi-Fi connection to the marina. Once the link between the WL70 and the marina is established, every wireless device on the boat will be online. 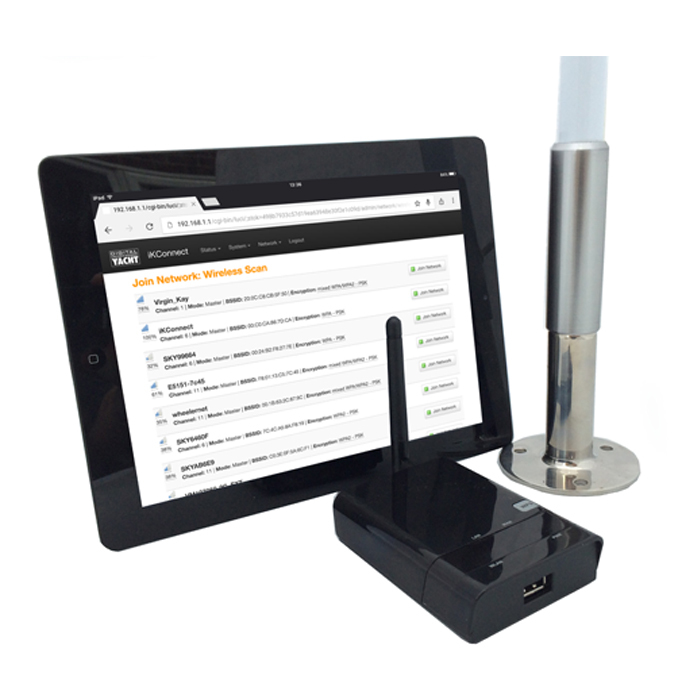 The combination of an iKConnect with a WL70 is the lowest cost complete Wi-Fi solution that Digital Yacht have ever released and is an ideal way to connect your non-3G iPad or Android tablet to the internet when in harbour. With a simple web interface that controls the WL70 to scan and connect to the marina hotspot, iKConnect makes getting an internet connection on your boat a breeze. iKConnect is also the perfect accessory for our latest iKommunicate Signal K gateway allowing mobile devices to wirelessly recieve the Signal K or NMEA data anywhere on the boat. In fact the combination of iKConnect, iKommunicate and a WL70 allows the boat to have a single wireless network that provides both navigational data and internet access, without the hassle of switching wireless networks.